Mass and Weight are two often misused and misunderstood terms in mechanics and fluid mechanics. Mass is a measure of the amount of material in an object, being directly related to the number and type of atoms present in the object. Mass does not change with a body's position, movement or alteration of its shape, unless material is added or removed. Mass is a fundamental property of an object, a numerical measure of its inertia and a fundamental measure of the amount of matter in the object. More about the SI System - A tutorial introduction to the SI-system. The British Gravitational System (Imperial System) of units is used by engineers in the English-speaking world with the same relation to the foot - pound - second system as the meter - kilogram - force second system (SI) has to the meter - kilogram - second system. 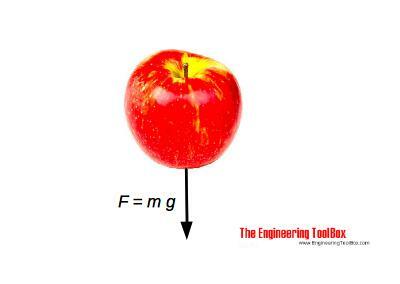 For engineers who deals with forces, instead of masses, it's convenient to use a system that has as its base units length, time, and force, instead of length, time and mass. The three base units in the Imperial system are the foot, the second, and the pound-force. In other words, 1 lbf (pound-force) acting on 1 slug mass will give the mass an acceleration of 1 ft/s2. With standard gravity - ag = 32.17405 ft/s2 - the mass of 1 slug weights 32.17405 lbf (pound-force). the unit of force is the pound (lb) alternatively pound-force (lbf). In the EE system 1 lb of force will give a mass of 1 lbm a standard acceleration of 32.17405 ft/s2. - there is a force (weight) of 16.1 kN between the car and the earth. Download and print kg to lb Converter! Engineering ToolBox, (2004). Mass and Weight. [online] Available at: https://www.engineeringtoolbox.com/mass-weight-d_589.html [Accessed Day Mo. Year].